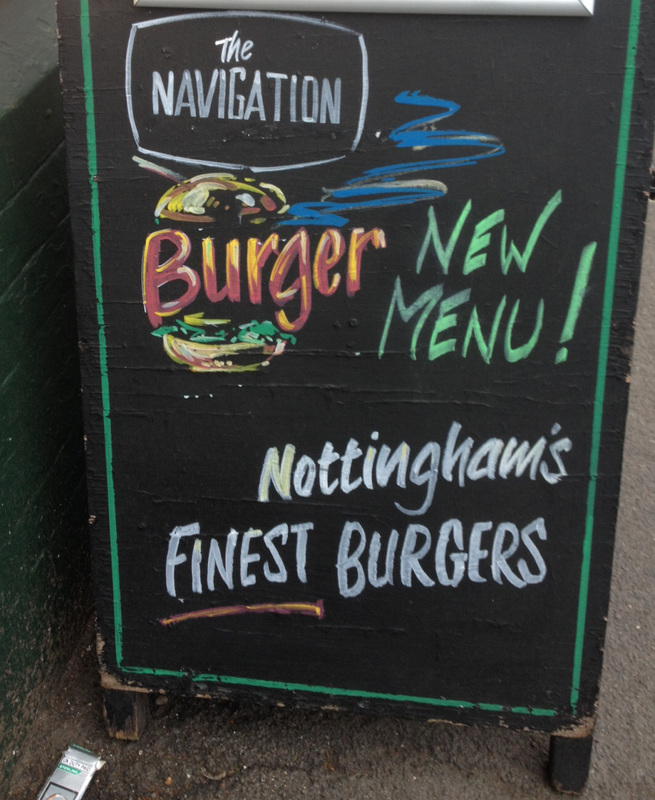 This week I visited The Navigation Burger Bar at the Navigation Inn on Wilford Street. I have to say it is Good to find that burgers are being flipped there once more. After a short hiatus following the departure of Annie’s Burger Shack to the Lace Market, a new chef is in place and they are back up and running serving up burgers in the pub. 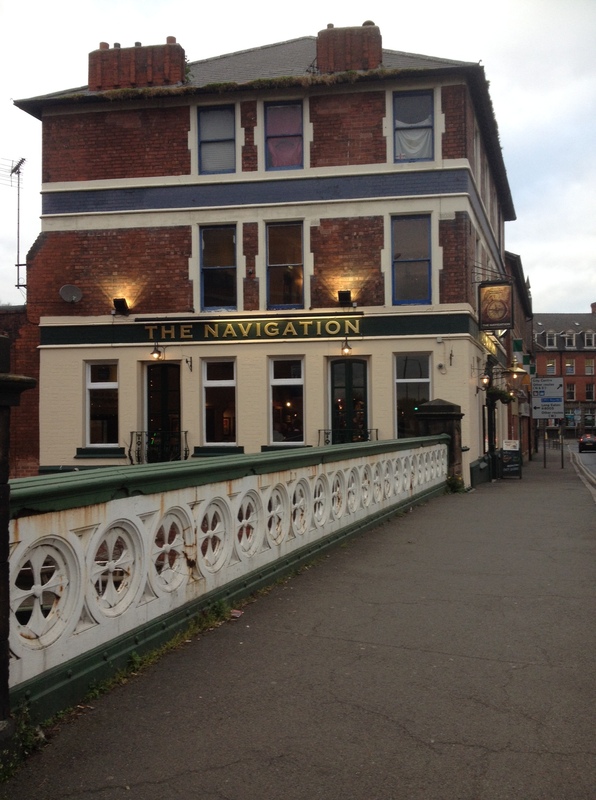 A recent article in the Nottingham Post “Lavish burgers are greeted with relish as The Navigation in Nottingham re-launches” tells the full story of the re-opening. 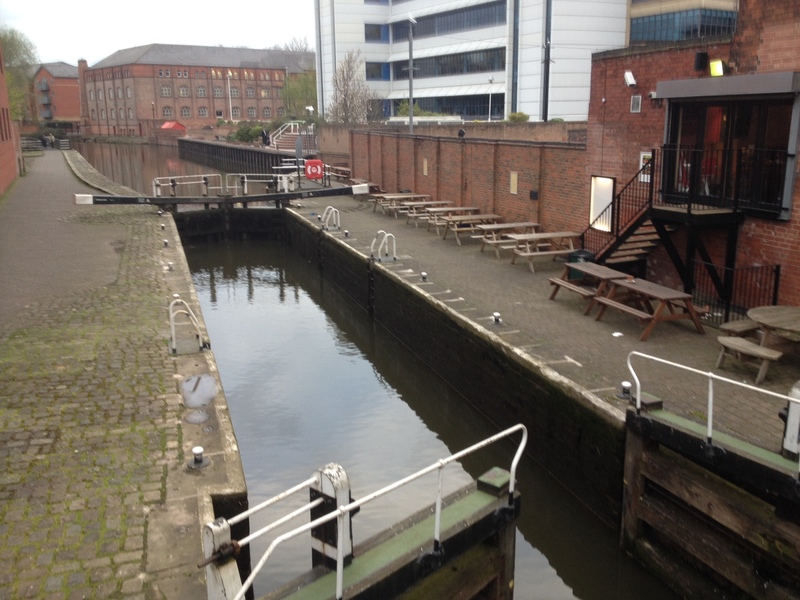 These days it’s history may be told by the bands and music lovers that have passed through it’s doors seeking live music, and in more recent times a shorter span of history may tell the tale of a quest to provide excellent burgers. The baton on that front has passed hands, as I have said earlier, and so today we are talking about the present incumbent of the kitchen Bob White, Lets talk about the burgers that he cooked us last week. 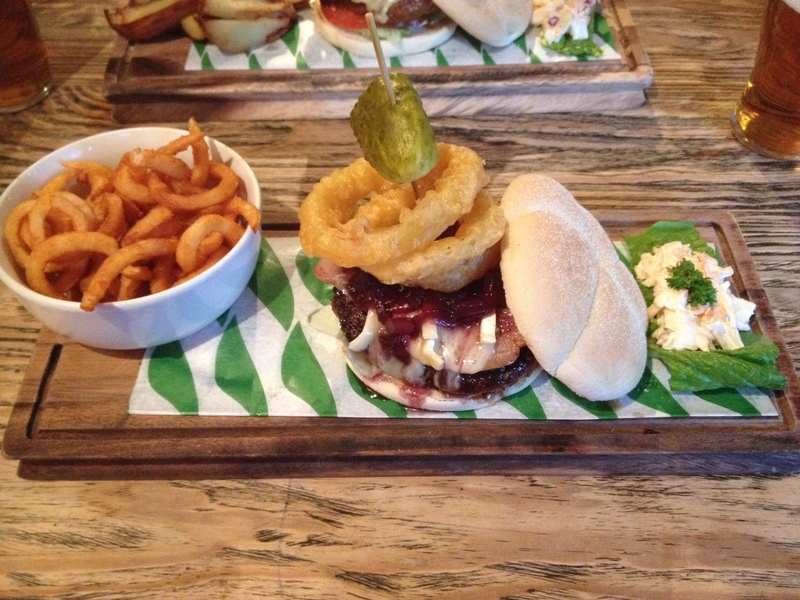 I ordered ‘The Forest Gump Burger’ which was described as ‘simple but standing proud – just naked or with melted cheddar’. I added the melted cheese onto my burger patty and out of the possible potato side options I got the salted potato wedges. I chose this burger for a smaller option as in the past I have been a bit overfaced by burgers in the navigation and suffered later from being too full. This burger was just the right size, it was a tasty well seasoned patty. I wasn’t given any choice of how I wanted it cooked and it was someway past medium but even so it was still quite moist and juicy. The burger sandwich had just about the right amount of salad filling, enough to add some crunch, some sweetness from the tomato, and enough to ease the conscience. I was quite a fan of the burger bun, it is a nice soft white flour bun. The juice from the burger soaked well into the top layer and the cheese had also oozed into the bread as well giving the sandwich a nice soft melty bite. 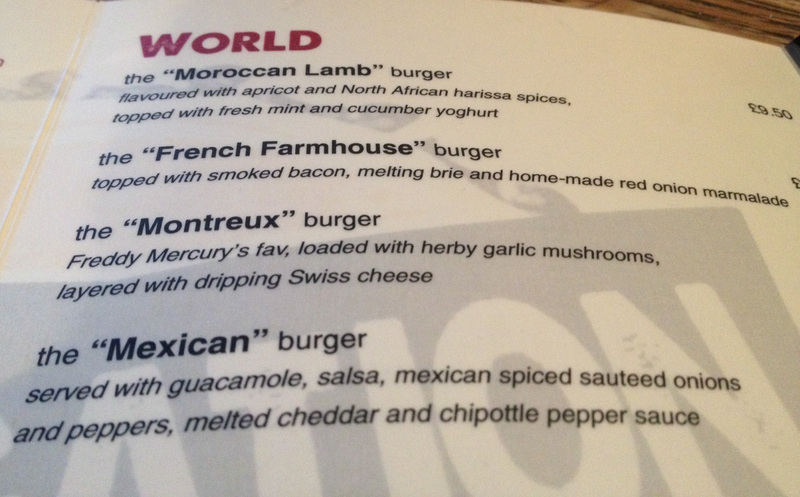 My dining companion ordered the “French Farmhouse” Burger which comes ‘topped with smoked bacon, melting brie and home-made red onion marmalade’. It was a little bit of a toss up I understand between this one and the ‘Smokin Blues’ burger which comes with a bluer cheese (the excellent Colston Bassett Stilton). The verdict was also tasty, the red onion marmalade was declared a winner of a topping. Both burgers came with a pile of unlisted onion rings on top of the burger, which I suppose on reflection were a nice bonus addition and perhaps this together with the large chunk of pickle on a stick is the Navigation Burger Bar calling card. I would personally have preferred both on the side, perhaps replacing the green leaf with coleslaw that returned on the board to the kitchen in the same state as which it arrived (unloved is a common comment I make on such plate (or board) fillers. Both Burgers were very good, on the verge of excellent. I don’t want to compare them with the other burger establishments in the city, but will state that for my personal choice they are right up there and probably looking to push into my top three burgers sampled in the city. They are a good size, have one of the best buns, and I also like the location where they live. 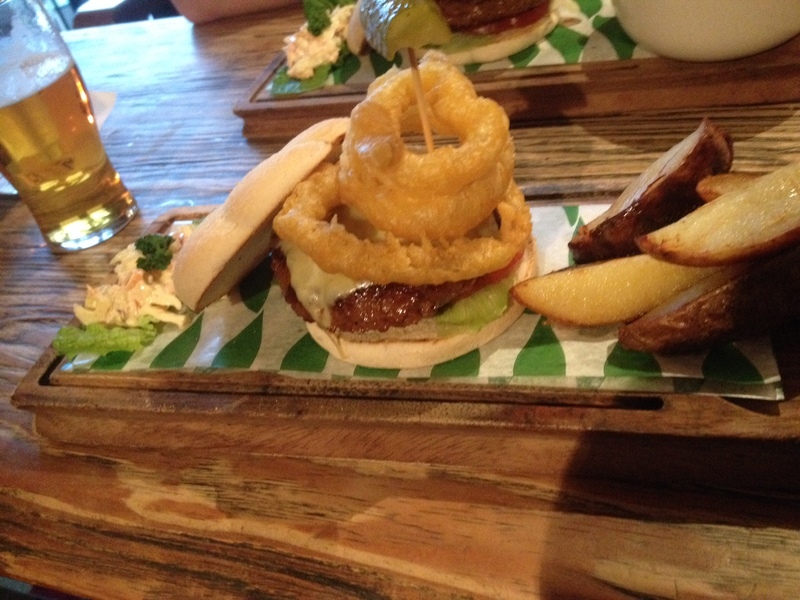 There is nothing quite like having a burger in a pub, with a decent pint alongside it. 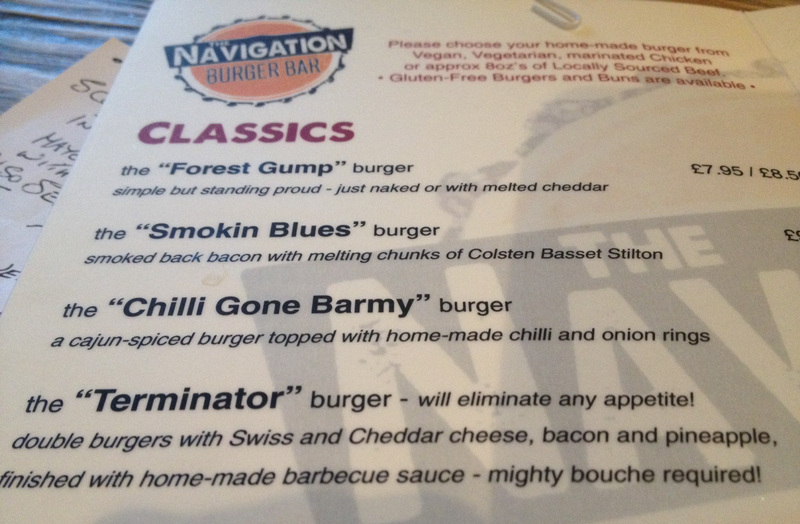 What I also like about the relaunched menu at the Navigation Burger Bar is that it is not just Burgers. That is a concept that I have struggled slightly with, as I like the name of the place to inform my brain and stomach as to ‘what I am about to recieve’. It does mean though that I can now take someone who has not got the appetite for a massive burger here, and they can have a wrap or a sandwich while I am chowing down on some sort of burger extravaganza. So what else ‘could‘ be on offer if you were not in the mood for a massive bite of burger sandwich? If I had not been here in the mind-frame of sampling a burger I may have tried out some of their “Barbequed Ribs ‘n’ Wings” with a choice of fries for £10.95. 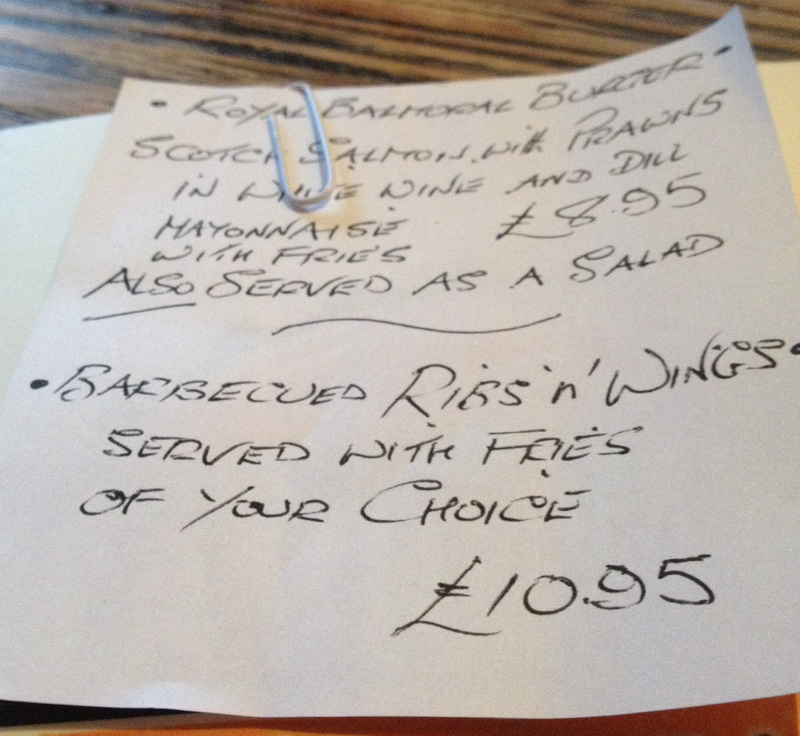 That was advertised as a special attached to the top of each menu with a paper clip. I wasn’t so sure about the other special which was a ‘Royal Balmoral Burger’ composed of “Scotch Salmon with Prawns in white wine and a dill mayonnaise” having said that, you could opt to have that combination as a salad which does sound like a tasty option. They are also serving a little bit of a wider range on the menu with a selection of hot dogs and wraps. I do like a proper decent hot dog and I may well return to see if their ‘dogs’ are worth the effort. It will all come down to the bite and the snap of the dog, and I don’t mean from the jaws of the dog itself. 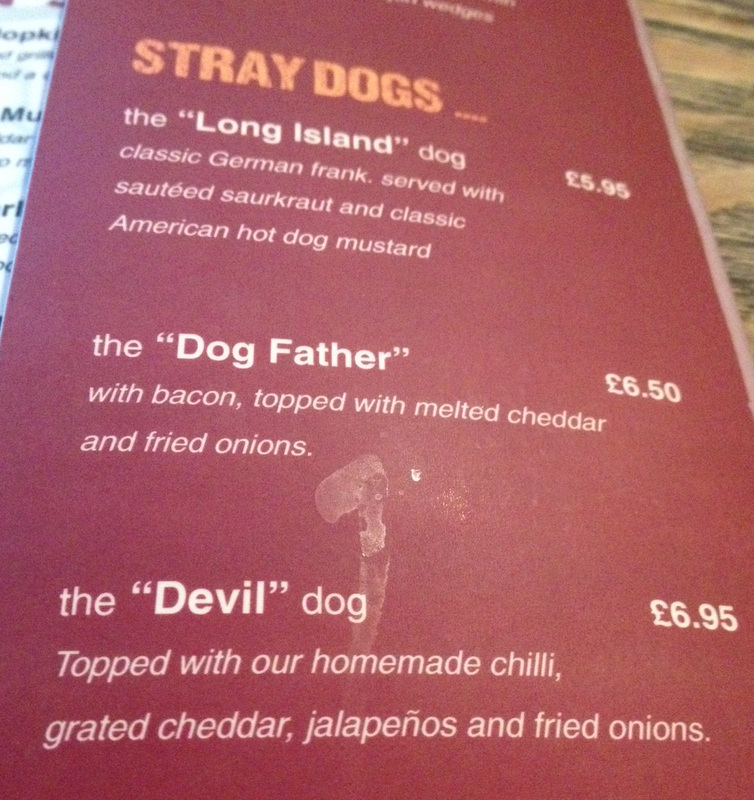 I like the sound of the ‘Dog Father’ just because it comes with bacon, cheese, and onions but only if it is a real proper hot dog sausage, not one out of a tin, or a ‘gourmet’ sausage. The ‘Long Island’ dog sounds like a better bet just because it says that it is a ‘classic German frank’ OK enough talking about the dogs I will have to try them now. I will be totally honest and say that even though I kindly have listed some of the other ‘non-burger’ options on the menu and ‘suggested’ that I may even sample them in the future. I may, but the chances that I would turn down the chance to try another one of the Navigation Burger Bar Burgers again is quite slim, sorry Mr and Mrs Wrap perhaps I will bring a friend to visit you one day.